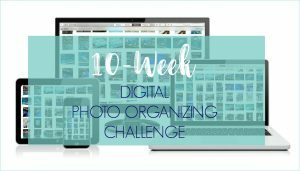 Welcome to Week 6 of the 10-Week Digital Photo Organizing Challenge! 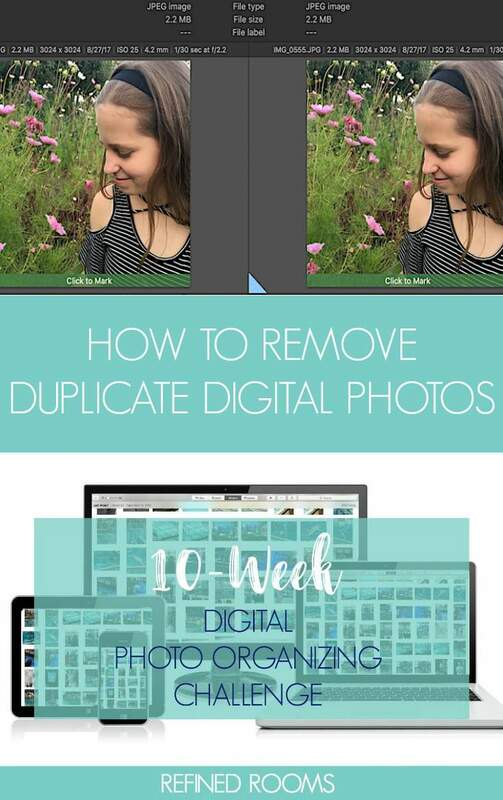 Today, we’re zooming in on a crucual step in the photo organizing process — deleting digital photo duplicates. So you’ve successfully sorted your images into their appropriate dated folder within your new core file structure. BRAVO! Now that that monumental task is behind you, things begin to get a bit more fun. This week, we begin to “declutter” your images by deleting the digital photo duplicates within your collection. As you can imagine, this step has the potential to be fairly time-consuming. Fortunately, there are some super helpful software tools out there to make the “de-duping” process go quickly. I use PhotoSweeper when working on a Mac (which I use to illustrate the de-duping process within this post). There are a few more options if you are using a PC. 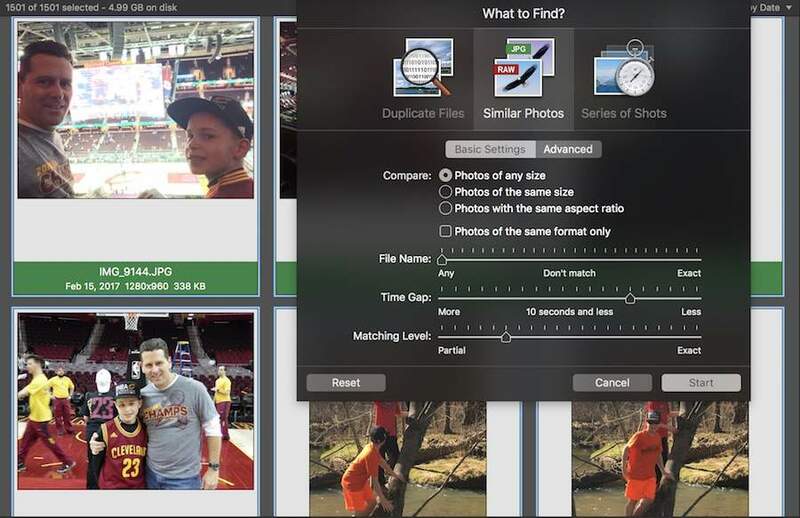 I’ve used Awesome Duplicate Photo Finder, when working on a PC. Other PC-based programs used by photo organizers include: Visipics, PhotoSort, and Duplicate Cleaner Pro. Take some time to explore the various software programs and determine which one you feel most comfortable with (features, user interface, price, etc.). Once you make a selection, your first order of business is to download the software and begin to play around with it. I highly suggest creating a “practice folder” of copied images that you can use to complete a series of de-duping runs in order to get a good feel for how the software program works. You can also search for tutorials on YouTube in order to fully explore the software features. Once you are in the thick of the de-duping process, you may encounter a moment of terror as you discover that you’ve inadvertently deleted photos that you didn’t want to delete. If you created a back-up copy of your original core file structure before you began the de-duping process, you’ll be able to restore those accidentally deleted photos and begin to breathe again! I don’t think I mentioned this in previous posts, so I’ll do it now. The only type of files that should exist at this point in your core file structure are image files (.jpg, .tif, .png, .gif). If you run the de-duping software on folders that contain other types of files, it has the potential to trip up the software. In order to avoid overwhelming the software and yourself, I recommend first running duplicate searches separately for each yearly folder within your core file structure. In the example below, I ran a search on my 2017 file folder, which contains 1501 images (so far). After the search is completed, my task is to visually compare 24 images and make decisions about what can be deleted. That’s do-able! 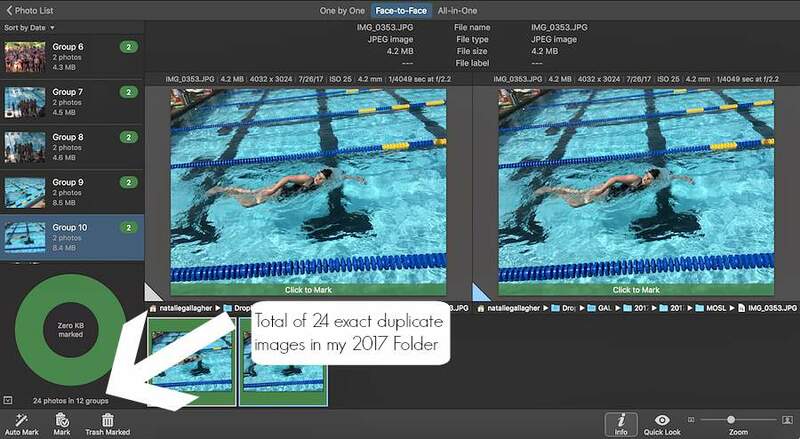 After you’ve gone through the process of looking at 100% duplicate match images within the year folder, repeat the process a few more times, adjusting the criteria of similarity. Most duplicate finder software programs allow you to dial in or out the criteria for defining a match. Play with it a bit to see what results pan out. 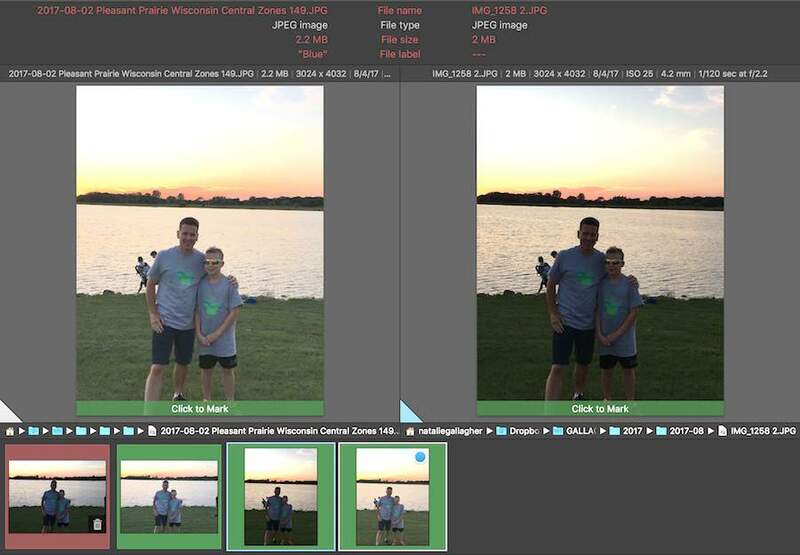 Since it makes no sense to keep 2 identical images in your collection, deleting the ones that have a 100% degree of similarity is really a no-brainer and doesn’t require any taxing decision-making on your part. 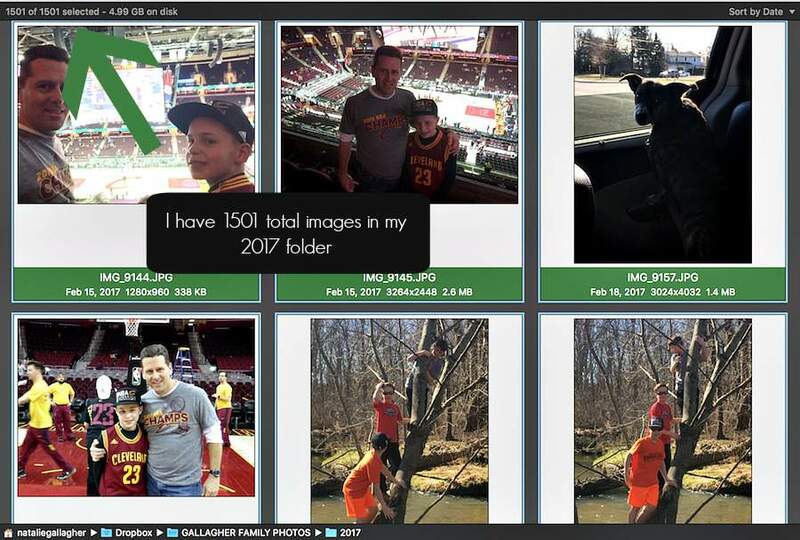 You can choose to move your deleted images directly into the trash, or move them to a “To Be Deleted” folder (if you prefer to place them in a holding area and delete everything at the end of the photo organizing project). As you work your way down the list of images, you’ll likely come across ones that are not 100% matches, but are similar enough that you’re willing to part with one of them. Whenever possible, keep the image with the larger file size and let go of the other one. 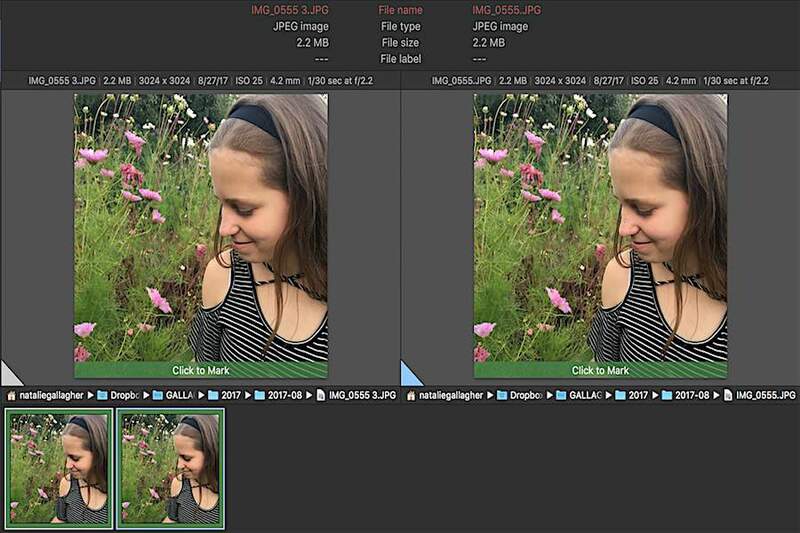 The larger the file size, typically the higher the photo quality/resolution. Just because two images are rated with a low degree of similarity, doesn’t mean that you are obligated to keep both photos. We often have many images that are taken in quick succession that capture essentially the same moment. Your job during the decluttering process is to make some tough choices to keep your image collection lean and mean. When I came across this comparison, I asked myself “do I really need both of these images?” Nope. I chose the one that I thought was the best (in this case, the one on the right, since my son was actually smiling ever-so-slightly!). Once I’ve completed the above-outlined de-duping process on each of the individual yearly folders, I then run my the master pictures folder (containing the entire core file structure) through the software program one last time. In theory, duplicates/similar pictures should be grouped together within a yearly folder, but conducting this one final run-through gives me peace of mind that I didn’t miss anything. Be sure to return later in the week to let me know about your progress in the comments, Facebook, or Instagram (use hashtag #DPOChallenge on Instagram). 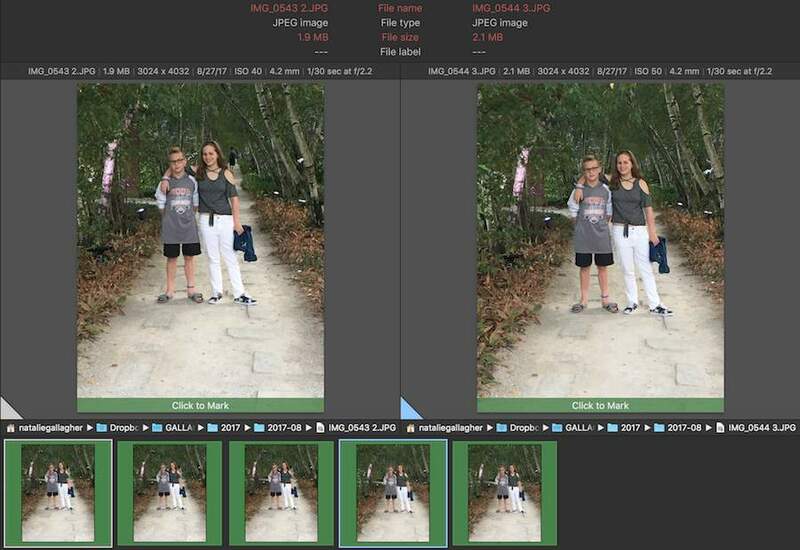 You could do the de-duping first, but I find that running a massive amount of photos at one time through the de-duping software can be very overwhelming. It’s a much more manageable process if you do it by monthly subfolder and that’s why I have the steps in the order that they are in the Challenge. I’m starting from week one! 🙂 Thanks for the series Natalie! Awesome Autumn! Keep me posted on your progress and let me know how many digital images are in your collection when you start…I’m curious! I haven’t been able to work through the weekly steps, but this information is SO valuable! I will definitely be coming back when I’m ready to work on my collection. The Challenge series will be here when you are ready Janet!